RIYADH, Saudi Arabia, April 13 (PNA) -– President Rodrigo Roa Duterte’s visit to the Kingdom of Saudi Arabia is a resounding success in terms of improving the lot of overseas Filipino workers (OFWs) and strengthening the Philippines’ ties with the Middle East country. This is the assessment of cabinet secretaries who were part of the delegation during a press briefing held at the Marriott Courtyard yesterday. Aside from Presidential Communications Office Secretary Martin Andanar and Presidential Spokesperson Ernesto Abella, ACTS OFW Party-list Rep. Aniceto Bertiz III, Department of Foreign Affairs Acting Secretary Enrique Manalo, Department of Labor and Employment Secretary Silvestre Bello III , and Department of Trade and Industry Secretary Ramon Lopez attended and faced the Filipino media. 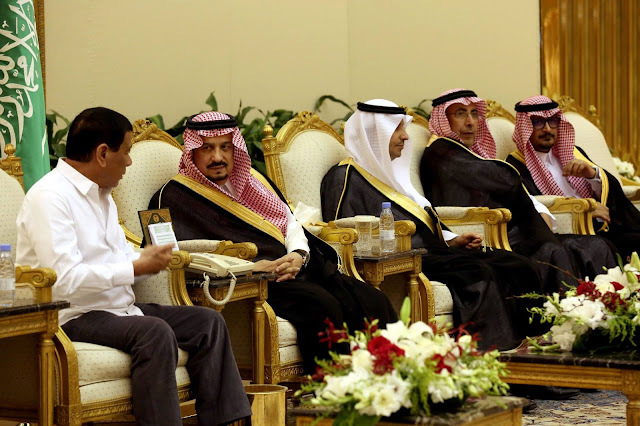 Cabinet members stressed that members of the Saudi government were singularly impressed with Duterte’s governance style and were receptive about the prospects of expanding business ties with the country. “We can explain the President’s visit here in three aspects: people, progress and partnership,” Secretary Manalo said as he stressed that Saudi Arabia is the top employment destination for Filipinos and is a major producer of fuel consumed in the Philippines. “We also consider this trip as something aimed at creating progress, that is to draw investors to the Philippines by showing potential investors that the Philippines is a viable destination for doing their business, and the fact that we also have a huge and fairly young population in the Philippines, ” Manalo added. Manalo pointed out that the delegation hopes to engage Saudi investments to Mindanao especially and particularly “its sectors of halal food security, energy security and tourism." For his part, Labor Secretary Silvestre Bello III said his counterpart in the Saudi government also agreed to negotiate on new rules to improve working conditions for Filipino overseas workers. “We are meeting with the Minister of Labor regarding the bilateral agreements that we signed yesterday. Basically, these agreements refer to the labor standards that provided our OFWs with rules on better wages, protection from maltreatment, working hours and other labor issues,” Bello said.